A special Holi recipe from Rajasthan. 1. Finely chop the bhang leaves and crust them well. 2. Add the ingredients except oil into a large bowl. 3. Add the bhang leaves and mix well, adding enough water, to a thick batter. 4. Heat oil in a deep frying pan over medium flame. 5. Drop small portions of the batter and deep fry until golden brown. 6. Remove and drain excess oil. 7. Serve hot with chutney of choice. 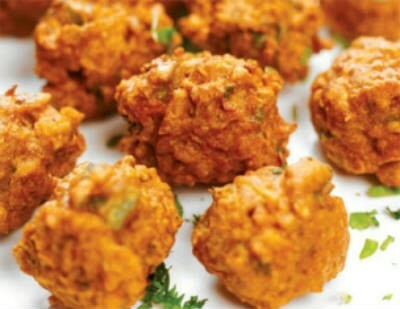 Feel free to comment or share your thoughts on this Bhang Pakora Recipe from Awesome Cuisine.